In heaven the blessed your glory proclaim, On earth we your children invoke your sweet name. Leader: Come Holy Spirit, fill the hearts of your faithful and kindle in them the fire of your love. Send forth your Spirit, and they shall be created. Leader: Let us pray. O God, who instructed the hearts of the faithful by the light of the Holy Spirit, grant us in the same Spirit to savor what is right, and always to rejoice in his consolation. Through Jesus Christ our Lord. People: Pray for us who have recourse to you. Leader and People: Lord Jesus Christ, who has glorified your mother, the Blessed Virgin Mary, immaculate from the first moment of her conception, grant that all who devoutly implore her protection on earth may eternally enjoy your presence in heaven. 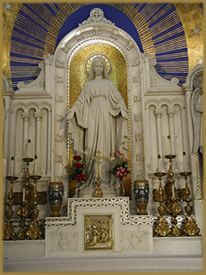 Lord Jesus Christ, who for the accomplishment of your greatest works have chosen the weak things of the world, that no flesh may glory in your sight, and who for a better and more widely diffused belief in the Immaculate Conception of your Mother, have wished that the Miraculous Medal be manifested to Saint Catherine Labouré, grant, we ask you that filled with like humility, we may glorify this mystery by word and work. Amen. Leader and People: Immaculate Virgin Mary, mother of our Lord Jesus and our mother, we have confidence in your powerful and never-failing intercession, manifested often through the Miraculous Medal. We your loving and trustful children, ask you to obtain for us the graces and favors we ask during this novena if they will be for the glory of God and the salvation of souls. (Here privately form your petitions.) You know, O Mary, how often our souls have been the sanctuaries of your Son who hates iniquity. Obtain for us then a deep hatred of sin and that purity of heart which will attach us to God alone so that our every thought, word, and deed may tend to his greater glory. Obtain for us also a spirit of prayer and self-denial that we may recover by penance what we have lost by sin and at length attain to that blessed abode where you are the queen of angels and of men. Amen. Leader and People: Virgin Mother of God, Mary Immaculate, we unite ourselves to you under your title of Our Lady of the Miraculous Medal. May this medal be for each one of us a sure sign of your motherly affection for us and a constant reminder of our filial duties towards you. While wearing it, may we be blessed by your loving protection and preserved in the grace of your Son. Most powerful Virgin, Mother of our Savior, keep us close to you every moment of our lives so that like you we may live and act according to the teaching and example of your Son. Obtain for us, your children, the grace of a happy death so that in union with you we may enjoy the happiness of heaven forever. Amen. Send your intentions to be remembered at our Lady's Shrine.